As part of our program to introduce the AAVSO and our 100 year tradition to as many people as possible in 2011, we determined to send a speaker from the AAVSO to as many major star parties this year as we could. 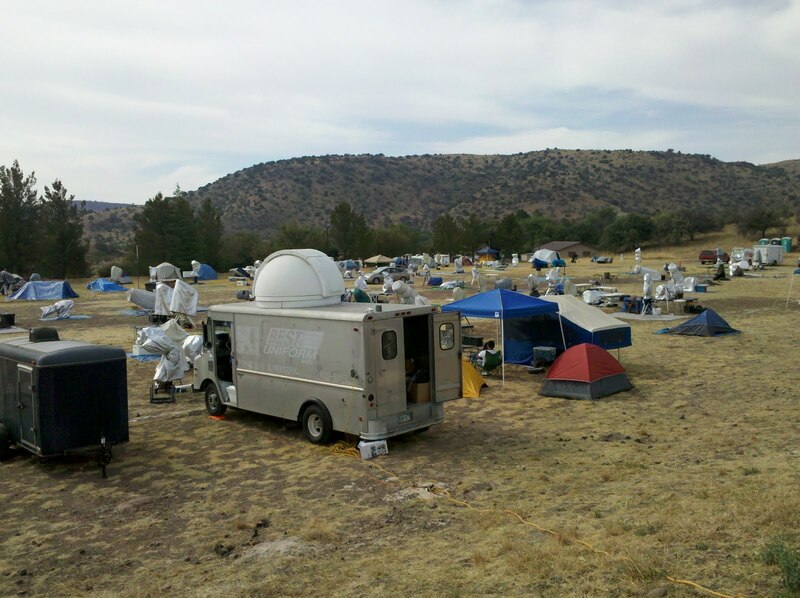 One of my assigned destinations in this mission was the Texas Star Party in Fort Davis, Texas. 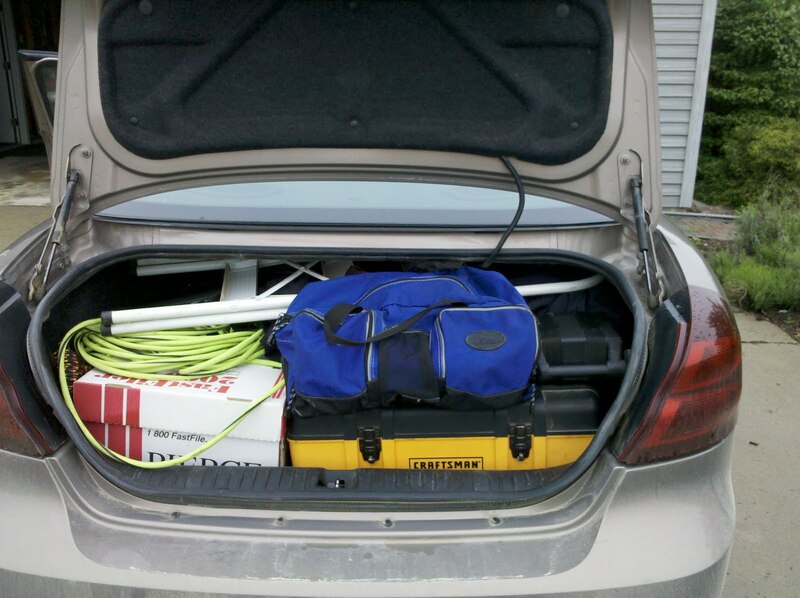 A couple days after returning from the joint AAVSO/AAS meeting in Boston, I was busy loading my 12” LX200 and all the necessary gear into my four-door sedan to drive the 1700 miles from my home in Michigan to the Davis Mountains in west Texas. I left home Sunday morning, May 29. I ran into a ferocious storm just south of Chicago that forced me off the road and under cover to escape the wind, rain and golf-ball size hail pouring down from a black sky. The same storm hammered Battle Creek, MI, later that day, and places east the day after, as it tore a path across the upper Midwest and northeast. Other than that, the trip was largely uneventful, and I made good time. The first night I stopped in Springfield, MO for the night. My original plan had been to push on to Joplin, but with the destruction from the tornado still dominating the headlines, I wasn’t sure there would be hotel rooms available for non-residents or non-relief workers. Monday night, I stayed in Midland, Texas, only a few hours away from Fort Davis. I just love Oklahoma and Texas, where the speed limit on the highway is often 80 mph. I could drive 94 mph without fear of getting a reckless driving ticket, and I did! I arrived in Fort Davis around 2pm on Tuesday. From there, it’s a short drive up highway 118, through some very pretty mountain terrain, to the Prude Guest Ranch, where the TSP is held. TSP is very well organized. I was greeted at the gate by organizers and shown where to check in at the office, where I picked up the key to a cabin I would be sharing with the other speakers. 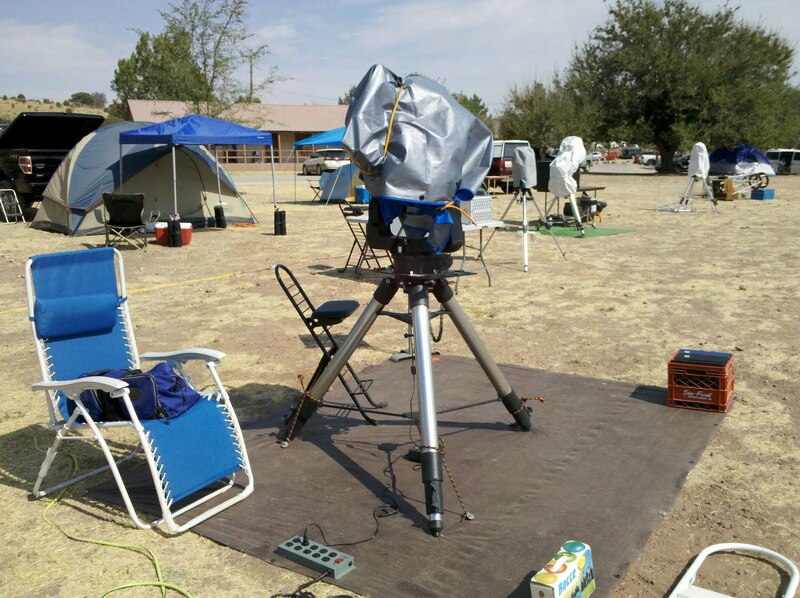 After unpacking, I claimed a spot on the middle observing field, right across the street from my cabin, and began to set up my telescope. On the advice of friends who had been to TSP before, I had purchased a tarp to cover the dusty ground around my scope and 10” spikes to nail it down with. They were not exaggerating at all when they told me I would need a three pound sledge hammer to drive the spikes into the rock-hard, red Texas dirt. When it came time to heft the 12” LX200 onto the tripod, several guys who had been watching me set up in the mid-day Sun from their shade canopy under a large tree, ran over and offered to help. I soon learned they were veterans of many TSPs and claimed the same spot under this tree each year. In fact, they were now unofficially known as “The Shade Tree Gang”. I met a lot of warm, friendly, intelligent people at TSP, but the Shade Tree Gang were a lot of fun, and we spent a lot of time together. I was pretty hungry by the time dinner was being prepared in the mess hall at Prude Ranch. I decided to beat the rush and get in line early because I was feeling a little weak and light headed. Not knowing exactly where to go I headed inside the office, which led to the buffet line and salad bar attached to the dining hall. I sat down with a few other early birds and waited for the dinner bell. I think I might have drooled a little as they began bringing food out and stocking the salad bar. After a while a back door to the building I did not know was there, suddenly opened and a line of people began streaming in. “This must be it!” I said to myself hungrily and walked over to the line, which led out the door, along the building, around a corner, up some steps and all the way to the door I had come in to wait for dinner in the wrong place. I was one of the first people to show up for dinner, and now I was at the very end of a long line. I didn’t have enough energy, and I was too dehydrated, to cry. At dinner that evening, I ran into my first fellow AAVSOer, Brad Walter. Brad and I had met before in Big Bear a couple years ago, but I didn’t recognize him right away with his safari gear and hat on. 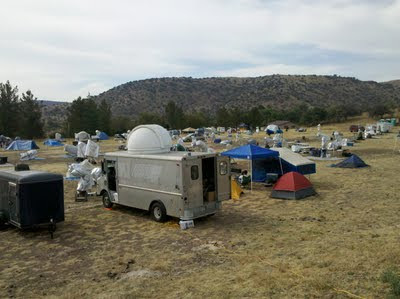 As it turned out, Brad was also camped on the middle field just yards from where my telescope was set up. After dinner I was finishing setting up for the night and began packing the tools and cases back into my car when Brad came over and told me I wasn’t done setting up yet. “What do you mean?” I asked him. Brad explained that even though my telescope was pretty darn heavy, the winds here in the Davis Mountains could be pretty fierce at times, and he advised me to tie down the three legs of the tripod to guard against the telescope blowing over! Clouds socked us in Tuesday night, and I decided to call it and get some sleep around midnight. Overnight, the star party was hit by, what could best be described as, a hurricane without the rain. Lightning flashed, thunder boomed and heavy winds, with violent gusts, shook the cabin until just before dawn. When I walked out into the bright Texas sunlight Wednesday morning there were signs of destruction and chaos everywhere. Some of the smaller tents from the night before just weren’t there any more. Many shade canopies were dangling from ropes or wrapped around cars, and tent poles stood or lay on the ground with no canvas attached to them. You could tell which way the wind had come from because every Dobsonian telescope at the star party was facing in the opposite direction, having been turned in the night like a hundred weathervanes. And sadly, there were a few telescopes that had toppled in the storm. Mine wasn’t one of them. It stood there unscathed, securely nailed to the ground. Brad had saved my telescope and my trip from disaster. I sent him a heart-felt thank you card the day after I got back from TSP. I did some exploring around the star party that morning, took some pictures, found the free coffee at the vendors display and eventually made my way over to the meeting hall where I met with Bill Flanagan, the MC for the afternoon paper session, to load the PowerPoints for my two talks into the TSP computer. This is also where I met Steve and Amelia Goldberg, two of the organizers of TSP. They were great. Talk about your power couple. If I needed anything, or something with my room wasn’t just right, Steve would bark orders into a walkie-talkie and it would be handled, bam, now, no questions. The talks after lunch were well attended. There were probably a hundred or more people in the hall. I gave condensed versions of two talks I have done before. Stand Back!, about citizen science projects in astronomy for amateurs, which of course features variable star projects, and Variable Stars and the Stories They Tell, which describes how variable stars fit into the larger landscape of astronomy and astrophysics using stellar evolution, the cosmic distance scale and the search for life in the Universe as examples. After the talks, Tim Parson, from Minnesota, came up and introduced himself. I knew Tim from online, but we’d never met, so it was another chance to put a face to a fellow AAVSO observer who until now was just an email address. We talked about telescopes, cold weather observing, cataclysmic variables, star parties and got to know each other. I like Tim a lot. Dinner Wednesday night was simply awesome. BBQ chicken, brisket and sausages, Pinto beans, potato salad, coleslaw, corn bread, cherry and apple cobblers; it was a feast. I sat with Tut Campbell of the CBA and learned all about his telescope farm and the observing he does. Tut is about as affable and friendly a guy as you’ll ever meet. He’s a passionate observer and I totally enjoyed listening to him talk while I gorged myself on barbecue. 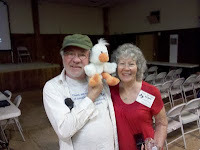 I also met Bill Pellerin, another active AAVSOer, who would be giving a talk on CCD observing Thursday afternoon. Wednesday night the weather just teased us for a few hours. It looked like it might clear up, so I had my scope powered up, aligned and on standby, but the clear, dark Texas sky I drove 1700 miles to see never materialized. I finally forfeited at midnight. Texas Clouds 2, Visitors 0. Thursday was my big day. I was the scheduled speaker for the evening program, so I took it easy and treated myself to a light day. I slept in, went in to town for breakfast at a little diner that had wifi, to catch up on email and check the weather reports, then drove around the countryside and did some sightseeing. I also took a trip up the mountain to McDonald Observatory to gawk at the big telescopes under the silver domes. After lunch, I checked out the vendors’ displays to kill time before the afternoon paper sessions. Bill Pellerin gave a very good introduction to CCD observing talk, which featured variable stars, AAVSO and VPHOT. Thursday, at dinner, I finally got to meet up with Walt Cooney, another AAVSO member. We had been playing phone tag, and missing each other since Tuesday when I arrived. After dinner I got called over to spend some time with Barbara Wilson, who would be hosting the evening program and introducing me. 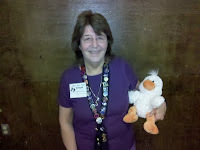 Barbara, a veteran of TSPs going back to the 80’s, is a legendary visual observer. She and her 20” telescope were featured in Timothy Ferris’ movie “Seeing In the Dark”. When the time came, and Barbara handed the mic off to me, I found myself standing in front of 400 or so amateur astronomers who had made the pilgrimage to TSP from all around the country to share the dark skies and camaraderie of the Texas Star Party. Now they were sitting there expecting me to entertain and inform them for a while as we all waited for darkness to fall. When we had first discussed my coming to TSP, I explained to Barbara that I wanted to give a talk about the first 100 years of the AAVSO, since this was our centennial year. She was quite honest and said she didn’t think that would be very appealing to the TSP crowd, who were by and large deep sky hunters and aficionados like her. So I created a whole new program specifically for TSP. My talk was called The Unpredictable Deep Sky. It featured deep sky objects that changed their appearance on human time scales. As I’m sure you’ve guessed already, many of these changes are because they are associated with variable stars of one type or another. The talk went well, it was just about the right length, the applause was enthusiastic, the Q&A was interesting but brief, and I felt a deep sense of relief as the crowd headed for the doors to go uncover their telescopes for what we all hoped would be a great night under the stars. I was on the down-slope now, my obligations having been met. I planned to coast through the next couple days and just enjoy the sky I had dragged my telescope 1700 miles to see. The overcast sky didn’t offer much hope, and the glow from the wildfires burning just a few miles to the west of us extended up 30 degrees into the sky. These were the worst kind of clouds. They’d thunder and lightning and spoil the night sky but the didn’t give up a drop of rain. This part of the country was parched. It hadn’t rained here since September. I refused to give up and hung out and talked and laughed with the Shade Tree Gang until well past midnight, hoping for a miracle. What we got was about half a miracle. The sky above us and to the south and east did clear up around 1:30am so we were actually able to observe for about three hours until just before dawn began to break. It wasn’t the incredible life changing experience I had hoped for. In fact, it’s that dark at my house on a good moonless night. But I was able to look through some other telescopes, try some new eyepieces and share the views of a few galaxies, nebulae and clusters in my 12” proudly. I was very impressed with Keith Venables’ portable 10” telescope, which breaks down to fit inside a gun case. He had it hooked up to an application running on an IPad that showed its location very accurately. So accurately, in fact, that he was able to locate several parts of the Veil nebula he had never seen before using it to guide him. The optics of his compact Dob were first rate, and I got my first look through a couple of Ethos eyepieces. I couldn’t get over how flat the field looked and how positively comfortable the eye relief and general feel of the Ethos was. I tried them in my LX200 and felt the same way, although it wasn’t as noticeable an improvement over the Naglers I normally use as I thought it would be. Still, I can see one or two of these fine eyepieces ending up in my kit eventually. At last, it finally felt like a star party. Tim Parson observed with me and we had fun comparing notes and just being around telescopes under the stars. Some people wandered by and we’d show them what ever we were looking at. It wasn’t a big score, but it wasn’t a defeat. I’d call it a scoreless tie. The Texas Clouds had not swept me. But I was still losing the series 2.5 to 0.5. The best I could do was tie, and it would have to be clear Friday and Saturday, which would mean I’d have to stay Saturday, instead of driving home, which was Plan A.
Friday morning I hurried into town to get breakfast and log on to the free wifi. TSP had wifi, but it wasn’t working very well, so this was the best way to get Internet access, check email and most important of all, check the weather. It was also the only time I could get phone reception, so checking in back home became part of the morning routine. But I had to rush through all that today, because at 9am was the swap meet outside the vendors building, and I had brought a box full of gear I never use any more to sell or trade. 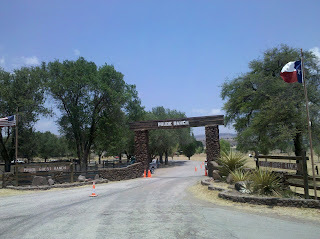 I arrived back at the ranch just as the swap meet was getting underway. I pulled my box of goods out of the trunk and set up shop in amongst the other hopefuls who had brought merchandise to sell or trade. I was in the mood to deal. I didn’t want to bring any of this stuff back home with me, and I had already purchased a new observing chair I had seen at one of the vendor displays. I needed to recoup my investment. I was a motivated seller and did very well. I sold everything, even the box! Friday lunch was actually brunch. They served eggs, biscuits and gravy, French toast, corned beef hash, bacon, sausage, hash browns, fruit and cereal. The weather may have sucked to this point, but the food was outstanding! After lunch they herded us all out on to the burnt lawn outside the dining hall for the traditional TSP group picture. 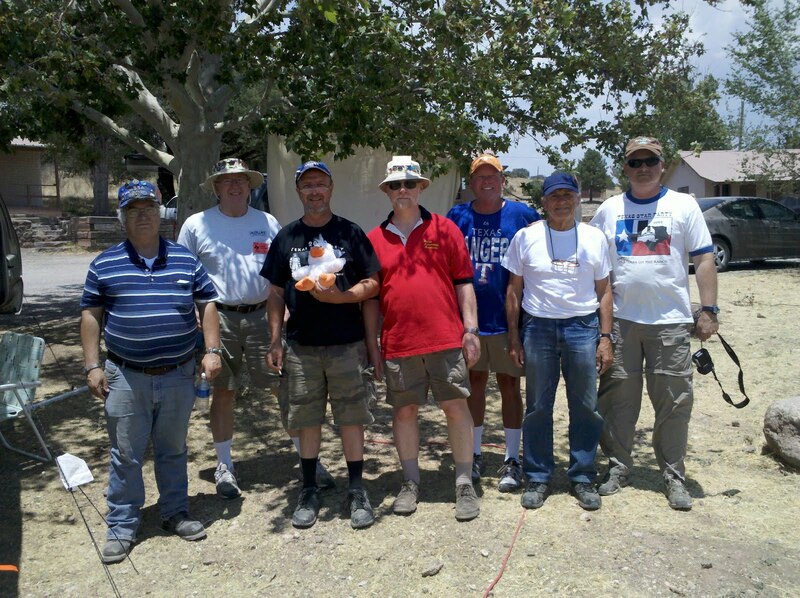 They arranged us and handed out letters that spelled Texas Star Party 2011. I took a long nap that afternoon and wrote some notes about the trip to use in any blogs or articles I was planning to write. The weather report was not looking very good again and I started mentally packing. After dinner Friday, Brad Walter and I sat down together for a while and he showed me some interesting projects he was working on in his spare time. One was a graph of the ASAS V magnitudes versus Landolt standards, which seemed to indicate ASAS V mags are pretty robust from 7th to 14th magnitude. I encouraged him to finish this work and have it published before the AAVSO All Sky Survey makes it obsolete! He also had a great idea for a variable star science website which I won’t describe here. Hanging out with brilliant people is one of the side benefits of going to astronomy conferences, meetings and star parties. Friday night was cloudy, so after the evening program, a talk given by C. Renee James about her new book, Seven Wonders of the Universe You Probably Took for Granted, we spent it socializing and partying. I read some of the funny stories from my blog to the guys and we shared our own stories of observing, traveling, star parties, and other misadventures. Sometime during the night I began thinking I’d come too far to give up and I was going to stay Saturday if the weather forecast looked at all promising. Saturday morning over breakfast I decided I was going to stay for the last day, just in case the weather broke. I had concluded that even though the weather forecast was questionable at best, I would be sick if I packed up and drove away from TSP just as the skies cleared over the Davis Mountains. I called home and told Irene I was going for ‘Plan B’. I also told her I’d be taking a different route home. One of the guys I’d become friends with was Art Smoot, an airline pilot from Dallas. He suggested I take a route through Texas west and then north instead of the way I came, to avoid the two lane blacktop roads I’d taken through northern Texas on the way down. I figured if there was anyone to listen to when it comes to getting from point A to point B it’s an airline pilot. Saturday afternoon featured another paper session. Keith Venables, one of the Shade Tree Gang, was giving a couple talks and I looked forward to hearing them. The first was an overview of all the telescopes he’d ever owned and what was right or wrong with them, called Equipment: How Much Is Enough? It was very clever and explained the evolution of his lightweight Dob that fit in a gun case. He is from the UK, and when airline restrictions on luggage and carry-ons were tightened after 911, he had to adjust his travel scope accordingly. He also gave an interesting talk about his attempts at finishing an entire Messier Marathon from different locations around the world. Dinner that evening was rib-eye steak, baked potatoes, veggies, rolls and salad bar. I know I’ve mentioned the food a lot in this piece, but the food at the Prude Guest Ranch is really quite good. With cloudy skies at night and hot dusty days, the food was one of the highlights of the trip. William Keel, from the University of Alabama, was the featured guest speaker Saturday night. He gave an excellent, if lengthy, talk on Citizen Science, featuring Galaxy Zoo, Hubble Zoo, Moon Zoo and other parts of the Zooniverse. The weather hadn’t improved at all. In fact, it started raining suddenly after dinner so I had to run back to my site to get things out of the rain. I got soaked doing it and had to change, so I missed the first part of Bill’s talk that night. I finally had to admit defeat and began packing things away that night, as best I could in the dark. Texas Clouds 4.5, Visitors 0.5. Sunday morning I was ready to pack up and hit the road. Observing had been a bust, but I’d had a good time anyway. I met people I only knew through email and made some new friends. I vowed not to let Texas clouds beat me, so I will be back one day, maybe next year. It took all day Sunday to drive across Texas from west to east. I stopped in Little Rock, Arkansas overnight then drove like a man possessed Monday to get home in one long push. I think the police in Indiana are still looking for me. I pulled into my driveway around 1:30am Tuesday morning where- you guessed it-- the Milky Way shone down on me from a clear, moonless sky. Sounds like you had a great time, except for the weather. I'd been observing at McDonald the week before, and the folks at the Visitor Center gift shop said, "Thank goodness your run ends before the Texas Star Party starts. It's always cloudy then." Had a great time meeting you at the TSP. Also enjoyed the talk you gave! Shame about the clouds but all you need to have a good time is some good food and some interesting people, seems like you got that in abundance! It was nice that you took Simochick along! You were lucky that Brad Walter gave you telescope advice, it would have been so heartbreaking if your telescope had gotten knocked over. Hopefully you'll have the clear skies that you craved so much next year.